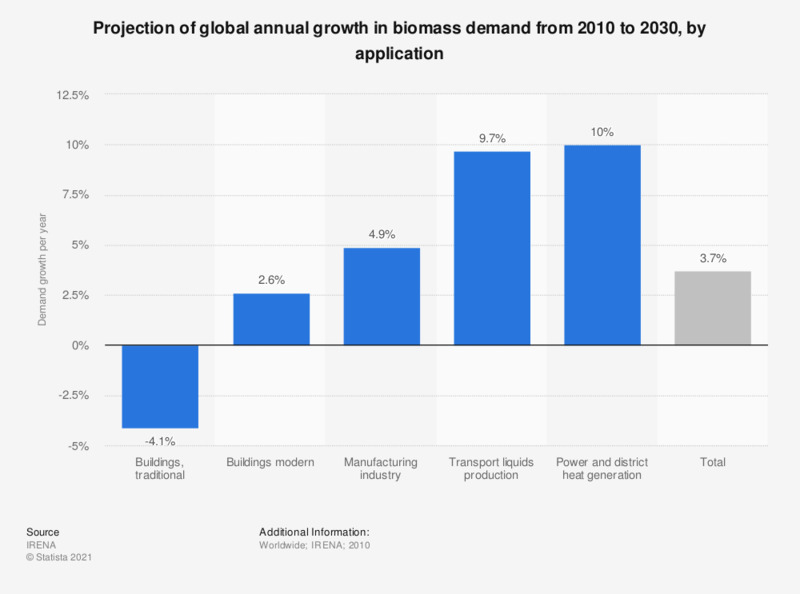 This statistic displays a projection of the annual growth of global biomass demand by application from 2010 to 2030. During this period, the biomass demand is expected to increase by 10 percent for power and district heat generation. Developing countries use biomass primarily for cooking, industrial applications, and electricity generation. Developed countries use biomass most for heating and electricity generation. Figures are in primary energy terms. To estimate raw biomass required for the production of liquid biofuels, a conversion efficiency of 50% is assumed to convert the final energy content of liquid biofuels to primary energy. Raw biomass refers to net input, thereby excluding biomass that goes back to the food chain, such as protein meal, dried distillers grains with solubles (DDGS), etc. and subtracting fossil energy required to produce, transfer and convert to final energy. Have you ever considered installing biomass boilers in your home?